To give it out straight, this Nixon Quartz Chronograph Rose Gold-Plated men’s watch relieves you from the tough task of deciding which one should you go for if you are new to the domain of watch complications. Nixon has been a prominent name with a decade-long reputation for superior functionality in the action-sports arena and now, they are stretching to the fashion-zone. The 51-30 (its nickname) signifies the diameter of the watch face (in millimetres) and the 30 is its underwater range (300 meters). Its roots and inspirations come from snowboarding and skateboarding and today, they have come a long way blending the powers of the two! The Nixon Quartz Chronograph Rose Gold-Plated 200M A037-897-00 Men’s Watch is all about raw steel, hidden well under a cover of smooth rose-gold plating. It brings together brain and brawn and combines the two into an arrangement that equips you for any fun-filled mission within the city or off it. The Nixon 51-30 chronograph’s crown position is against the norm but that adds to its uniqueness. It is on the left side of the watch along with the pushers; the ensemble adds to comfort and helps avoiding wrist bites. Plus, it plays up the little details the way its user will like it, strengthening further Nixon’s ‘custom-built’ point of view. 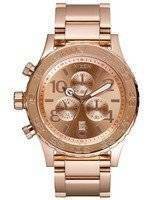 The Nixon Quartz Chronograph Rose Gold-Plated 200M A037-897-00 Men’s Watch is the BIG one among the big watches. The 51-30 is quite a show with its 51mm diameter, so unless you have slightly-large to really thick wrists, its sheer size is going to terrify you and it should. Its largeness is ostentatious and demands attention because of a perfectly thought out design. It’s raw, manly steel that ready to go deep and withstand serious punishment in all your adventures, including the aquatic ones. • A 300-meter waterproof rating; ensures precision and performance under pressure. • Measures one-tenth of a second; the chronograph is an advanced one. • Unidirectional steel bezel that works as a countdown timer. Baking or short trips under water, you can use it for both. • Brushed stainless steel as case and band material and a double-locking clasp ensures maximum durability. Despite all that, the Nixon Chronograph is very much of a daily wear, especially for them into the showbiz. Once you get used to its size and heft – which typically takes a few days – you won’t want to take it off. It feels that good. A real stunner in the big watch market, this is also for the times when you are heading a wedding or a big banquet. This entry was posted in Nixon Watches, Watches and tagged Nixon Chronograph, Nixon Corporal, Nixon Time Teller, Nixon Watches on May 3, 2016 by citizenwatches.